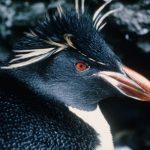 Northern Rockhopper Penguin | WhaleTimes, Inc.
Red eyes, yellow eyebrows, something wacky going on on top of its head, and a surly disposition make the northern rockhopper penguin (Eudyptes moseleyi) a wonderful addition to any Hagfish Day celebration. Rockhopper penguins are about 21 inches (55 cm) long. They can weigh 6 pounds. 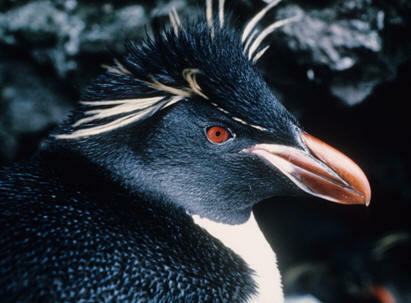 Rockhopper penguins mainly eat krill, but also dine on squid, crustaceans, octopus, and fish. Rockhopper penguins are crested penguins. It’s lovely golden crests really make its red eyes stand out! You can probably guess why they’re called “rockhoppers.” Yep, they hop, with both feet, from rock to rock. It is rugged bird that matches the rugged terrain of where it breeds and hunts. Nothing gets in the way of this fearless penguin on its way too and from the rookery. Boulders, cliffs, sleeping seals…it bounds up or over it all. Sharp claws help it hop and climb. A rockhopper uses its sharp beak to protect itself and to encourage intruders or pesky neighbors to leave it alone!